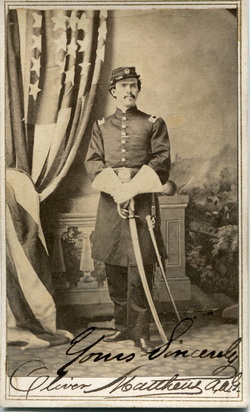 Oliver Matthews (1839-1874) served during the Civil War as an officer in the Assistant Adjutant General Department. He saw action in the ill-fated Red River Expedition of 1864, where he was wounded. His correspondence with James Roosevelt ranges over many subjects, including presidential and military politics, New York City “copperheads,” and the supply of (or lack of) whiskey available during holidays spent in the field.